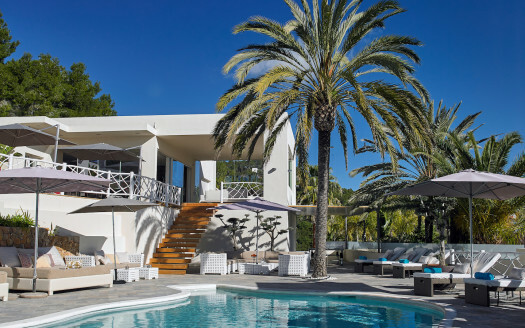 Luxury villa for rent, located just a few kilometres from the centre of Ibiza, the prestigious five-bedroom rental villa VAGABUNDA sits high on the hillside of the exclusive Roca Llisa residential area (Ibiza). 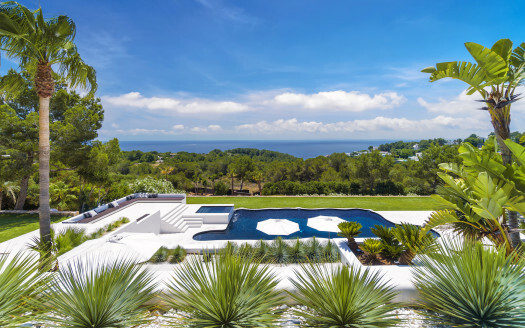 Designed by a notorious spanish architect, the villa is an enclave of luxury and peace that blends with the surrounding countryside and breath-taking scenery of the Mediterranean Sea. The villa’s interiors are the archetype of open architecture; with sophisticated blend of classic and contemporary lines styled with artwork of exquisite taste by celebrated artists and photographer. The villa stylish designed furniture matches with harmony the surrounded environment. Spa equipped with Hamman, bath, shower and sauna cabin. The main living area is a wide and bright open plan and an impressive glass bay overlooking the sea on one side; the other side mounted with a luxuriant wood paneling integrated with hidden storage space. The 80 square meters living room, which also can be used as a dining room is furnished with a twelve seats dining table and in the salon area is fitted with an extra-large comfortable sofa and fully equipped with a state-of-the-art sound system with hand-made unique-pieces Martion Orgon speakers. 2 suite bedrooms with double size beds and en-suite bathrooms both exposed to the stunning panoramic view. 2 double bedrooms each with a double size bed share a connected lounge and bathroom. Master bedroom suite fitted with a king bed size, an en-suite bathroom with a Jacuzzi mosaic decorated, a walk-in closet and a direct access to the terrace and the pool. Street level: parking for 3 cars, with elevator. 3 terraces and a chill out on the rooftop terrace. Non-smoking villa, except in the bar-cine room. 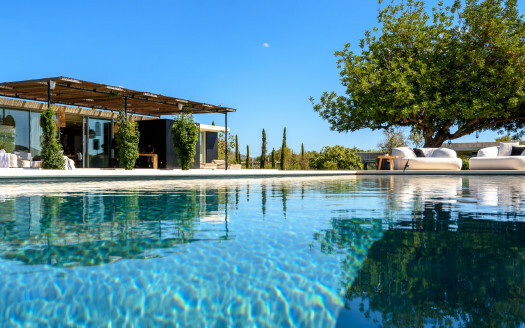 The villa is just 2 minutes drive to Cala Olivera beach and Roca Llisa Golf, and 10 minutes from Ibiza town and 20 minutes from the airport.